The HyperDuino system is actually 3 distinct parts, and they can even be used separately from one another. The first part of the system is the HyperDuino "piggy-back board" (also called a "shield") for the Arduino, or any Arduino Uno compatible board (including adapters for the Raspberry Pi). If you're interested in the technical details of the HyperDuino hardware and software, click here for information and features. For "smart car" robotics projects, and advanced experimentation and invention, the HyperDuino+R board provides the most versatile and efficient platform for the Arduino available. On the Arduino micro-controller is the HyperDuino Program (firmware), which is a variant of "Standard Firmata" that recognizes the 12 touch sensors of the HyperDuino board. The HyperDuino Media Linker app is the 3rd part, and interconnects digital media on a Chromebook, or any other device running the Chrome browser, with a physical project. With the HyperDuino, project building and further experimentation is fun and efficient! 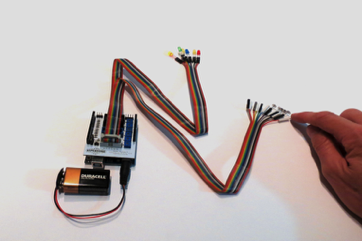 Here are two short videos introducing the HyperDuino and showing how the LEDs and touch sensors add interactivity to any model or posterboard project. There are two key parts to the HyperDuino photo. 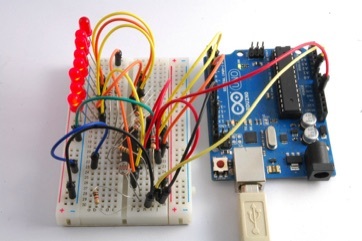 The second idea is even more important: when looking at any other Arduino tutorial kit or device, think of the question, "How do I actually get the sensors and lights into my project?" Look at the photo above on the right with the breadboard, and think about what you would do next to actually put those LEDs and sensors into a real project. It's not straight-forward or even particularly easy. And in a classroom setting with lots of students and projects going on at the same moment it can be overwhelming. The system shown on the left with the HyperDuino is the answer: the easy-connect cables of the HyperDuino and simple sockets for each of the LEDs and sensors provide easy placement directly in your project. If you already have some experience with the Arduino, you'll appreciate the other great feature of the HyperDuino: it does away with the need for a breadboard and jumper wires for the great majority of projects and experiments.